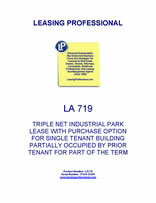 This Lease (“Lease”) is made as of _________________, by and between COMMERCIAL PROPERTY LANDLORD, INC., a __________________ corporation (“Landlord”), and AGREEABLE TENANT, INC., a _________________ corporation (“Tenant”), and all of the terms and conditions set forth below and in the attached Exhibits, each of which are incorporated into this Lease by this reference. For and in consideration of the mutual covenants and conditions set forth in this Lease, Landlord hereby leases to Tenant, and Tenant hereby leases from Landlord, the Premises as described in Section 1.1 (b) below. (a) Building. The "Building" shall mean the building and improvements located at _______________________. (b) Premises. The "Premises" shall mean ____________ square feet of rentable area located within the Building and as depicted on the attached Exhibit "A". (c) Prior Tenant Lease. Tenant acknowledges that, as of the Effective Date, a portion of the Premises ("Prior Tenant Premises") are currently leased by ________________ ("Prior Tenant") pursuant to a Lease dated ____________ ("Prior Tenant Lease") between Landlord and Prior Tenant. A copy of the Prior Tenant Lease has been provided to Tenant. Tenant's leasing of the Premises pursuant to this Lease shall be subject to the Prior Tenant Lease and Prior Tenant's right to possession and quiet enjoyment of the Prior Tenant Premises during the term thereof, as the same may be extended. The Prior Tenant Premises contain _____________ square feet of rentable area, consisting of (i) the area depicted as exclusive Prior Tenant space on the attached Exhibit "A" and (ii) a _______________ percent (________%) portion of the common space within the Building as depicted on the attached Exhibit "A". The initial term of the Prior Tenant Lease is scheduled to expire on ____________. Prior Tenant has one (1) option to extend the term of the Prior Tenant Lease through and until ____________. During the term of the Prior Tenant Lease, as the same may be extended, (A) Prior Tenant shall have the right to use the Prior Tenant Premises pursuant to the terms and provisions of the Prior Tenant Lease; and (ii) Tenant shall bill Prior Tenant directly for the actual cost of electricity service to the Prior Tenant Premises, subject to the applicable provisions of the Prior Tenant Lease. During the term of the Prior Tenant Lease, as the same may be extended, Landlord shall pay Tenant the sum of ______________ Dollars ($_________) ("Reimbursement Amount") on a monthly basis as a reimbursement of Prior Tenant's allocated share of Base Rent, Operating Expenses and Real Property Taxes, subject to the provisions of Section 1.5 below. The Reimbursement Amount shall be pro rated for any partial month based on the actual number of days in the applicable month. Landlord shall use commercially reasonable efforts to enforce the terms and provisions of the Prior Tenant Lease. Upon termination of the Prior Tenant Lease for any reason (other than by agreement between Landlord and Prior Tenant to voluntarily terminate the Prior Tenant Lease without Tenant's prior written consent, which may be withheld in Tenant's sole and absolute discretion), (1) the Premises, for all purposes under this Lease, shall be deemed to include the Prior Tenant Premises and (2) Landlord shall not be obligated to pay Tenant the Reimbursement Amount. 1.2 Use: Distribution and light assembly of manufactured products and related office and administrative uses, subject to Section 5 below. 1.3 Term: The term of this Lease ("Term") shall be for eighty-four (84) months, commencing upon the Commencement Date (as defined below), subject the provisions of Section 2.4 below. The "Commencement Date" shall be the date which is sixty (60) days following the earlier of (a) the date of Substantial Completion of the Tenant Improvements (as defined in the Work Letter Agreement attached as Exhibit "B" ("Work Letter") and incorporated herein by this reference) (with the exception of "punch list" items, as provided in Section 9 of the Work Letter), or (b) the date on which Tenant commences its ordinary business operations from the Premises or any portion thereof. The target Commencement Date is ____________. Tenant shall have two (2) options to extend the Term for periods of five (5) years each, pursuant to Section 2.5 below. 1.4 Rent: Base rent payable for the Premises ("Base Rent") during the initial twelve (12) month period of the Term shall be _________ Dollars ($_____) per rentable square foot of the Premises per month (i.e., $__________). Base Rent shall be increased annually on each anniversary of the Commencement Date by an amount equal to three percent (3%) of the Base Rent payable for the immediately preceding twelve (12) month period pursuant to Section 3.2 below. Rent shall be payable in advance on the first (1st) day of each month during the Term, and shall be subject to a late charge if not received by the tenth (10th) day of such month, as provided in Section 12.4 below. Provided that Tenant is not in default under this Lease after the lapse of any applicable cure periods, Base Rent shall be abated for month fourteen (14) of the initial Term. 1.5 Initial Rent Payment: Concurrently with delivery of the executed Lease, Tenant shall pay Landlord the sum of ____________ Dollars ($______) ("Initial Rent Payment") (i.e., an amount equal to $_________ per month, less the $_________ monthly Reimbursement Amount, for six months) in immediately available funds, which shall be applied toward the first five (5) monthly installments of Base Rent. Landlord shall not be obligated to pay the Reimbursement Amount during months one (1) through (6) of the initial Term. The remaining, unapplied portion of the Initial Rent Payment, together with the month six (6) Reimbursement Amount (i.e. $__________), shall be retained by Landlord as the Security Deposit for the remainder of the Term, as the same may be extended. 1.6 Security Deposit: ______________ Dollars ($_________) ("Security Deposit"), payable as provided in Section 1.5 above. 1.7 Tenant's Share of Operating Expenses: One hundred percent (100%), subject to the provisions of Section 3.3 below. In addition, Tenant shall pay for the actual cost of electricity services to the Building (subject to the provisions of Section 1.1(c) above) and security services required by Tenant, if any. 1.8 Parking: Approximately three (3) spaces per one thousand (1,000) square feet of rentable area. Ten (10) spaces shall be reserved spaces located at the entrance to the Building for Tenant's visitors. 1.9 Broker: Landlord shall pay a commission to ______________ (____________) equal to ____% of the Base Rent value of the initial Term (i.e., ____% of $__________ = $__________), fifty percent (50%) payable upon full execution and delivery of this Lease, with the remaining fifty percent (50%) payable upon the Commencement Date. If the Purchase Option is exercised and the Closing occurs pursuant to Section 37 below, Landlord shall pay a commission to Business Real Estate Brokerage Company equal to ____________________ Dollars ($__________) (i.e., ____% of $__________), less (a) the amount previously paid to ______________ as provided above in this Section 1.9 and (b) The Amortization Delta Amount (as defined in Section 37(b) below). 1.10 Limited Purchase Option: See Section 37 below. 2.1 Term. The terms and provisions of this Lease shall be effective as of the Effective Date of this Lease. The Term and Commencement Date of this Lease shall be as specified in Section 1.3 of the Basic Lease Provisions. 2.2 Acceptance. On the Commencement Date, Tenant shall be deemed to have accepted the Premises in their then existing condition and subject to all applicable recorded easements and covenants, conditions and restrictions, including, without limitation, the Declaration of Covenants, Conditions and Restrictions for ___________ Industrial Park recorded _____________, ("CC&Rs"), and all applicable zoning and municipal, county, state and federal laws, codes, ordinances and regulations, including without limitation, laws and regulations pertaining to the Americans with Disabilities Act of 1990, 42 U.S.C. § 12101, et seq., as amended, and the Comprehensive Environmental Response, Compensation, and Liability Act of 1980, 42 § U.S.C. 9601, et seq., as amended (collectively, "Applicable Laws"). Notwithstanding the foregoing, Landlord represents and warrants that it has received no written notice (and is otherwise unaware) of any violation of any Applicable Laws, including, without limitation, any laws or regulations regulating the use, storage and release of Hazardous Material, affecting the Building or the Premises as of the Effective Date. Landlord shall be fully responsible, at Landlord's sole cost and expense, for correcting and/or remediating any such violations existing on or prior to the Commencement Date. In addition, and without limiting the foregoing, Landlord shall construct or cause the construction of the Tenant Improvements pursuant to the Work Letter in compliance with Applicable Laws, including, without limitation, applicable building and electrical code requirements. 2.3 Notice Confirming Commencement Date. Following the Commencement Date, Landlord shall deliver to Tenant a notice setting forth the Commencement Date and expiration date of the Term, which notice shall be in the form of Exhibit" C" attached hereto. Tenant shall execute such notice and return the same to Landlord within five (5) days of receipt thereof. 2.4 Option to Terminate. Provided that Tenant is not in default under this Lease after the lapse of any applicable cure periods, Tenant shall have a one-time right ("Termination Right") to terminate this Lease effective on the date which is _______ (___) months after the Commencement Date, provided that (a) Tenant shall deliver written notice of its exercise of the Termination Right, if at all, on or prior to the date which is ______ (___) months after the Commencement Date and (b) concurrently with such notice, Tenant shall pay Landlord an amount equal to the sum of (i) the unamortized cost of the Tenant Improvements (i.e. $_____________), amortized over the initial ________ (___) year term with interest at a rate of ______ percent (___%), as of the effective date of termination, and (ii) the unamortized portion of the commissions paid to the Broker (over the initial ________ (___) year term), as of the effective date of termination. The Termination Right is personal to the original Tenant hereunder and may not be assigned except in connection with a Permitted Transfer pursuant to Section 11.1 below. 2.5 Options to Extend Term. Provided that Tenant is not in default under the Lease after the lapse of any applicable cure periods, Tenant shall have two (2) options (each an "Option"; collectively, the "Options") to extend the Term of the Lease for additional periods of five (5) years each (each, an "Option Term") on all of the same terms and conditions of the Lease, except as expressly provided below in this Section 2.5. Tenant may exercise each Option by delivering written notice to Landlord of its intention to so extend the term of the Lease no later than the date which is six (6) months prior to the expiration of the existing Term. Base Rent payable during the each Option Term shall be ninety-five percent (95%) of the Market Rate (as defined below) as of the date on which Tenant exercises the applicable Option. The "Market Rate" shall mean the terms and conditions which would be offered to a non-renewing, non-expansion, non-equity, non synthetic-lease tenant for comparable space with improvements of comparable age, appearance and quality of construction located in the ___________ submarket of ____________, taking into account the value of existing tenant improvements over standard tenant improvements, parking ratios, rental rates, rent concessions, operating expense base year, rent increases and equivalent location, access, visibility and signage. Comparable lease terms shall be based on five (5) year transactions with corresponding adjustments to rental rates and concessions. Landlord shall determine the Market Rate by using its good faith judgment and shall provide written notice of the Market Rate to Tenant within fifteen (15) days after Tenant delivers notice of exercise of the applicable Option. Tenant shall have thirty (30) days ("Tenant's Review Period") after receipt of Landlord's notice of the Market Rate within which to accept such rent or to reasonably object thereto in writing. In the event that Tenant objects, Landlord and Tenant shall attempt to agree upon the Market Rate using their good faith efforts. If Landlord and Tenant are unable to reach agreement within fifteen (15) days following Tenant's Review Period, then each party shall select an independent arbitrator who shall by profession be a real estate broker who shall have been active over the past five (5) year period in the leasing of commercial properties in the vicinity of the Building. Neither Landlord nor Tenant shall consult with such broker as to his or her opinion as to the Market Rate prior to the appointment. The two brokers shall determine the Market Rate, taking into account the requirements of this Section 2.5 within five (5) business days after appointment. In the event that the brokers are unable to agree on the Market Rate within such five (5) business day period, the brokers shall select a third similarly qualified broker to determine the Market Rate pursuant to the provisions of this Section 2.5 within five (5) business days thereafter. The new Base Rent shall be equal to ninety-five percent (95%) of the Market Rate, subject to annual increases as provided in Section 3.2 below. The Options are personal to the original Tenant hereunder and may not be assigned except in connection with a Permitted Transfer pursuant to Section 11.1 below. 3.1 Monthly Payment. Tenant shall pay Landlord Base Rent and Operating Expenses set forth in Sections 1.4 and 3.3 above, respectively, without notice, demand, offset or deduction. Tenant shall pay Landlord the Initial Rent Payment provided in Section 1.5 above upon execution and delivery of this Lease. Rent for any period during the Term which is for less than one calendar month shall be prorated based upon the actual number of days of the applicable calendar month. Rent shall be payable in lawful money of the United States to Landlord at the address stated in Section 22 below or to such other person or at such other places as Landlord may designate in writing. 3.2 Annual Increase to Base Rent. As used in this Lease, the "Adjustment Date" shall mean the annual anniversary of the Commencement Date, on which date the Base Rent shall be increased by an amount equal to three percent (3%) of the Base Rent payable for the immediately preceding 12-month period.